Located inside Comfort Suites in historic downtown Carlisle, this restaurant offers a modern rustic atmosphere with a stone fireplace and wooden floors. The dining rooms seats 45 diners with additional seating at the bar. The restaurant features a strong emphasis on locally-sourced foods and sustainability. Menu items include "simple and honest" food such as Mason Dixon Crabcakes, The Molly Burger, Colonial Chicken Pot Pie, and Bourbon Bird. Whiskey is the focus of the drinks menu with over 50 domestic and international whiskeys available. Patrons can also enjoy other drinks such as artisan cocktails, organic liquors and Pennsylvania spirits. The name of the restaurant stems from when President George Washington led a group of militiamen to western Pennsylvania to put down the "Whiskey Rebellion" started by a group of farmers angry of the imposed 25 percent tax on whiskey. President Washington met and took command of the militia at the Carlisle Barracks. 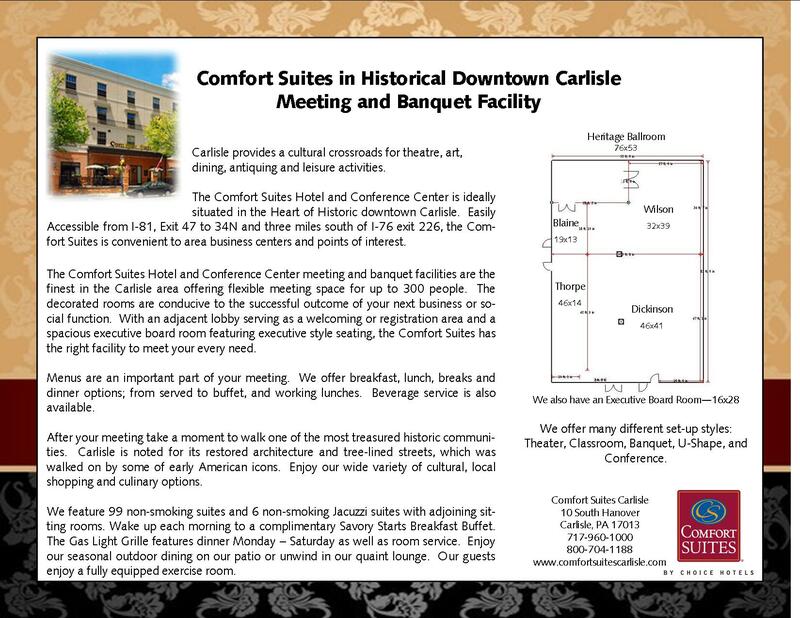 Description The Comfort Suites Hotel & Conference Center meeting and banquet facilities are the finest in the Carlisle area offering flexible meeting space for up to 400 people. These are conducive to the successful outcome of your next business or social function. With an adjacent lobby serving as a welcoming or registration area and a spacious executive board room featuring executive style seating, the Comfort Suites Hotel & Conference Center has the right facility to meet your every need.